Industrial liquid coatings market has established a highly impressive position in the coatings space, given that coatings are integral to maintain industrial equipment that are prone to corrosion and other hazards of wear and tear, significantly deprecating their value and service life. Industrial liquid coatings market has gained a potentially expanded reach not only because coatings are apt in protecting such equipment like oil and gas pipelines but also such floors on which heavy machineries are placed for long periods or machineries that require a non-stick inner surface. Industrial liquid coatings offer the advantage of not being limited by the surface material on which they can be applied. Sometimes the material that passes through machinery or the environment in which the machinery is placed can prove to very corrosive. Such is the case in the oil and gas industry where upstream and midstream segments present an array of unique challenges as they move oil and gas towards refineries. As both cutting capital costs and adhering to strict environmental regulations is inevitable in the oil and gas industry, using effective and eco-friendly coatings to protect assets is essential. The expansion of the global oil and gas industry is thus expected to play a remarkable role in the growth of the industrial liquid coatings market. Industrial coatings are subject to some of the most demanding conditions in case of offshore oil and gas production where relentless contact with rough seawater and extended exposure to penetrating UV rays can shorten coating system life cycle. But offshore environments make maintenance difficult, therefore coatings must be so manufactured as to have a long service life besides including advanced personnel safety considerations such as non-skid attributes when used on decks, high-visibility colors and advanced fire and heat resistance. Industrial liquid coatings typically feature intumescence, heat-resistance, high levels of corrosion resistance and the durability to extend component life that proves highly viable in oil and gas pipelines. To gain a competitive edge, industrial liquid coatings market participants have identified certain key performance trends that are in demand such as corrosion-resistance and more advanced coatings that have the versatility and robustness to perform well on complex substrates such as surfaces made with mixed metals, plastics and other materials. Also, the industrial liquid coatings market is creating renewed growth scope by developing products that are suited for application in all parts of the world and that can maintain consistency in quality and color regardless of the condition of the equipment they are applied on such as warm or sub-zero temperature, humid or dry climates etc. One of the challenges that is being faced by the industrial liquid coatings market lately is that of sustainability. As environmental legislation is tightening around the world including countries like India and China where industrialization is at full-swing at present, industrial liquid coatings market players are looking for alternate solvents with low levels of VOC, with customers raising the demand for higher-solids and waterborne products. For instance, Axalta Coating System develops wide-range of environmentally-conscious products such as the waterborne coatings to high solids solvent-borne coatings with an intention to offer an environmentally-friendly product portfolio that can meet varied customer needs. Cost consideration is a big motivator in the industrial liquid coatings market. While protective coatings applicators look for coatings that involve ease of application and additional productivity in saving time and labor while limiting environmental impact, end users that will eventually own and operate the coated assets look for long-lasting asset protection that will minimize total cost of ownership and operation. Innovations in the industrial liquid coatings market are being inspired by environmental legislation as well as the need of reducing direct maintenance cost and interruptions that can cause expensive downtime of operations. 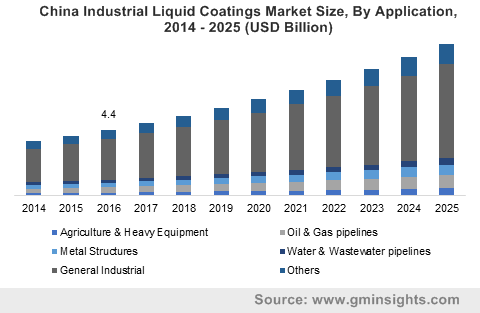 With rapidly expanding industrialization trends worldwide, industrial liquid coatings market is expected to surpass $70 billion by 2025.